One more picture from the evening of the 29th. The Pleiades star cluster (with some interstellar dust), a stack of just two 2-minute exposures because the moon was rising. This is another case of "teaching a new dog old tricks" because I'm using new (to me) equipment to take a picture that I've taken many times before. (The Pleiades are one of the few things that are easy to photograph well on film, so I've been photographing them a long time.) Still, it was good enough to put in the Daily Notebook. Last night (October 29), we had unusually clear air, and at my home in Athens, Georgia, I was able to do quite a bit of deep-sky photography (for a change!). My goal was to find out the best way to use my battle-weary Nikon 180/2.8 ED AI lens, which has perceptible decentering and chromatic aberration at f/2.8 (probably not detectable with film, only digital sensors). Results: (1) It works fine at f/4, even with an extended-red-sensitivity camera; (2) with the AVX mount, I can expose for 2 minutes without guiding corrections, or 3 minutes if I want to throw out a few frames. All of the following pictures were taken with that lens at f/4 and a Canon 60Da camera (with Nikon lens adapter), and each is a stack of ten 2-minute exposures. 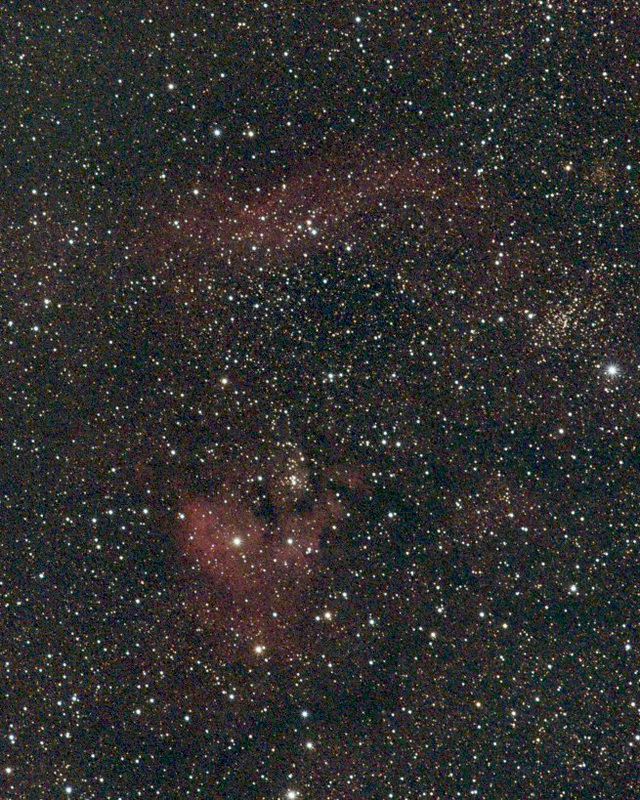 This should be quite comparable to the picture that I took with a Nikon camera body a couple of weeks ago, but the Canon 60Da has extended red sensitivity to pick up more of the faint red light emitted by hydrogen nebulae. Click and see how you like each picture compared to the other. 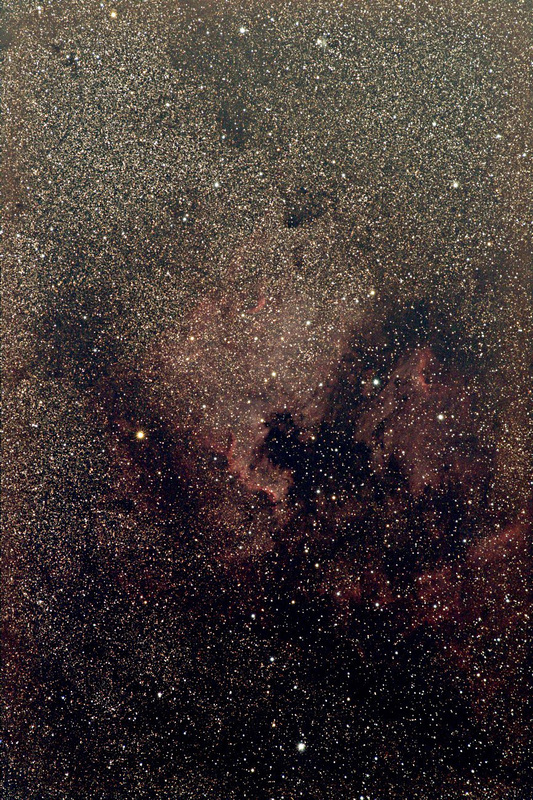 These faint nebulae are, respectively, NGC 7822 (top) and Cederblad 214 (bottom). The star cluster at the right is NGC 7762. They are in the constellation Cepheus, and I'm surprised I was able to photograph them from town. 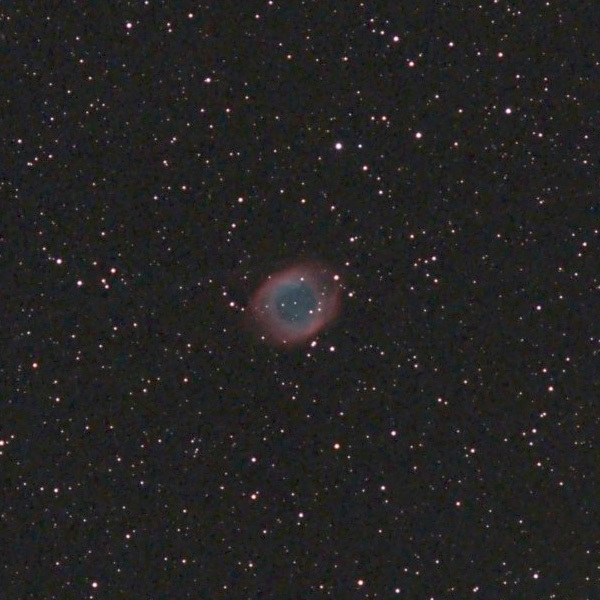 Here's the Helix Nebula (NGC 7293), a well-known (but very faint) nebula in the constellation Aquarius, the remains of a star that blew off its atmosphere. It is not actually helical, but a few strands of thicker gas make it appear so. 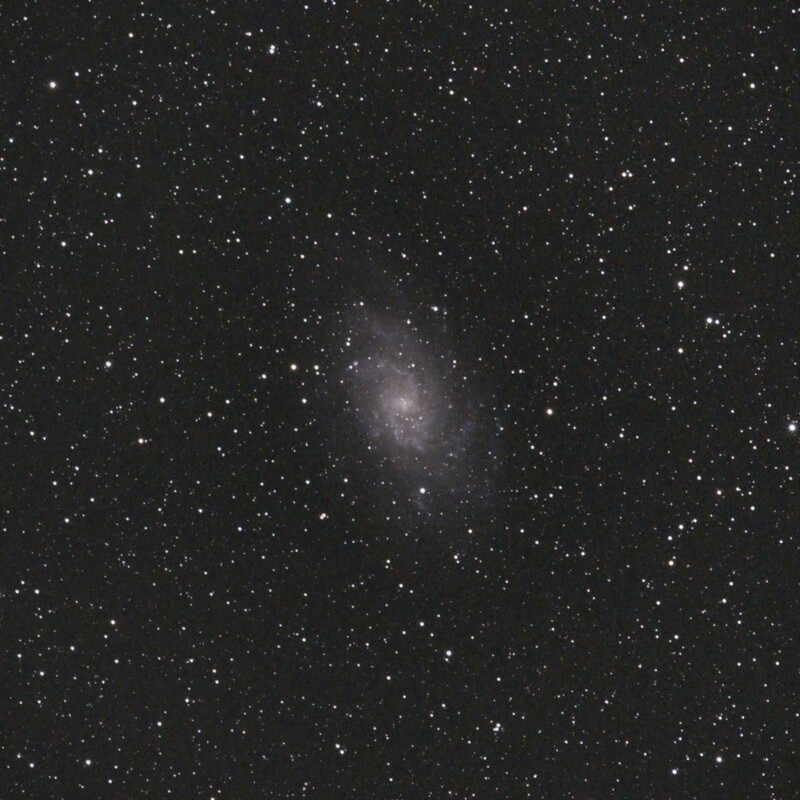 This is the galaxy M33 in Triangulum, which I have photographed often as a test of various piece of equipment. At its upper left is a pair of stars, one of which is fuzzy. 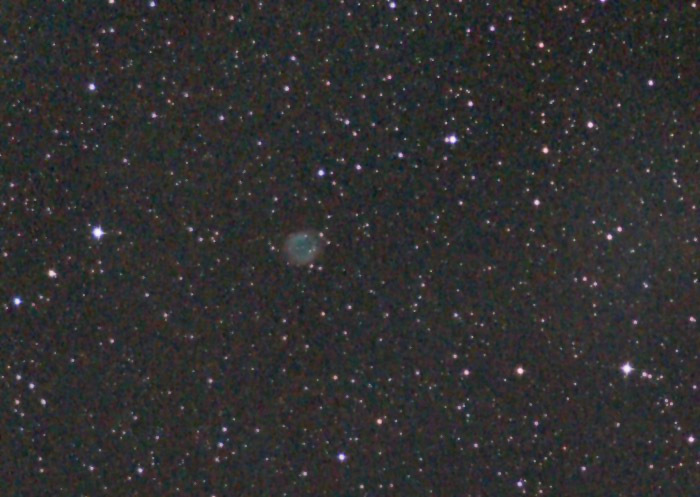 The fuzzy one is actually a great nebula in the distant galaxy; the sharp one is a foreground star. 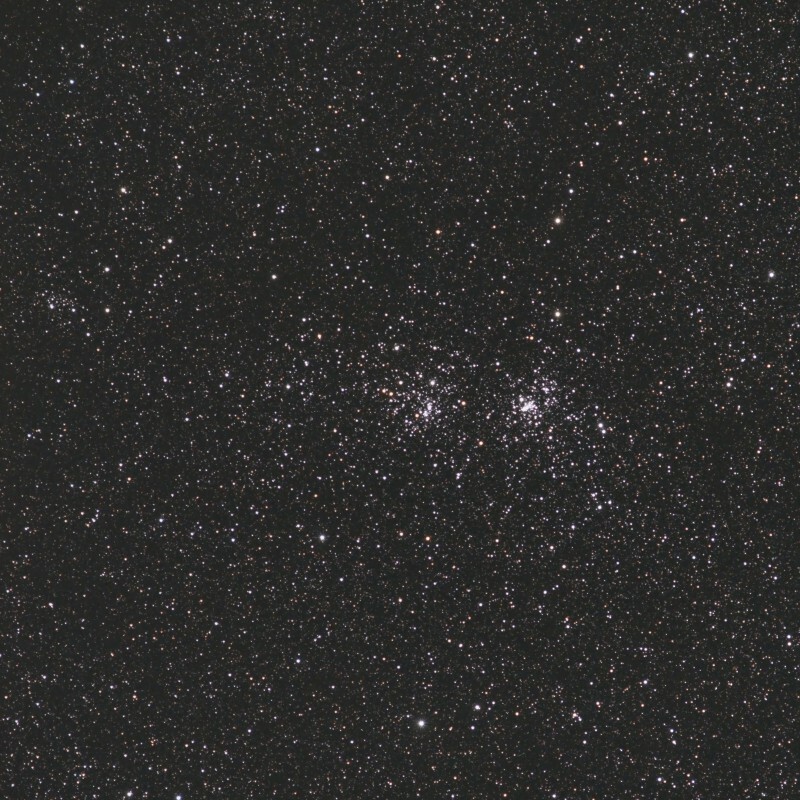 Finally, here is the Double Cluster (NGC 869 and 884) in Perseus. I want to call your attention to the background, and in particular, the subtle diagonal streaks above and to the right of the cluster where there is a relative lack of stars. (One bright row of stars runs parallel to them.) 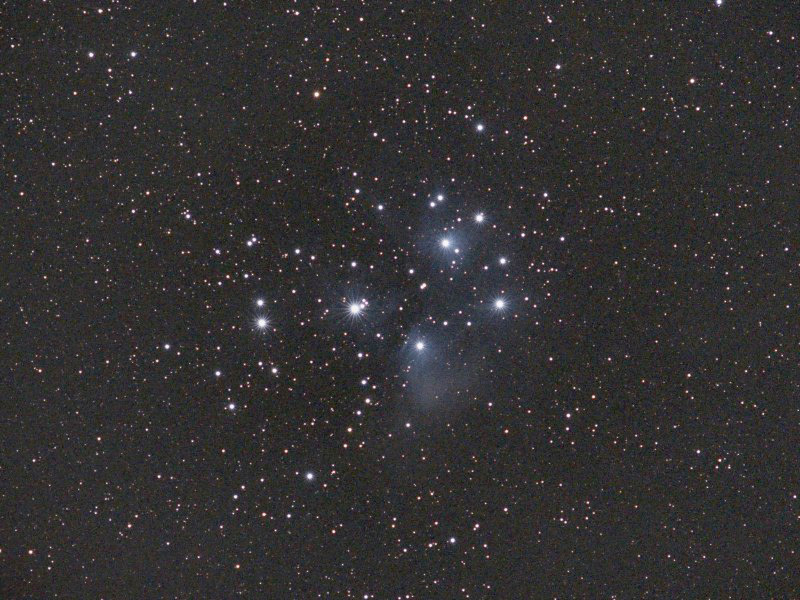 The dark streaks are dark nebulae, made of interstellar dust, and so is the small starless patch to the right of the clusters, which is designated Barnard 201. All civilized and decent people deplore and denounce the terrible shooting in Pittsburgh yesterday, which comes all too close to being a resumption of the worst horrors of the 20th Century. All, not just the ones who added a Star of David to their Facebook picture or made a special statement on social media. Some of us added a Star of David to our Facebook pictures to show support for the victims and to denounce the crime. Others did not because they thought it might strike some people as misappropriation of a sacred symbol; or because they made their statement another way; or because they felt that the wrongness of such a horrible crime went without saying. At times like these, we must take care not to be divided over well-meaning people's use of symbols. I salute my friends who have changed their pictures, and also those who express their opposition to genocide in other ways. I've blogged a lot of the story of how Melody and I met, but I've omitted one thing I did, on the day we met, that really impressed her. The 6400 was being demonstrated for us by systems programmer Ken Williams, whom I knew from my part-time job working with the computers. Probably not even realizing I would appreciate the opportunity to impress a girl, Ken challenged me to a battle of wits. He would call out a mathematical problem and the computer would solve it at the same time I did, if I could, and we'd see who would get the answer first. The problem was, "What is the sum of all the integers, inclusive, from 1 to 1 million?" I remembered just enough of Gauss's way of summing the integers from 1 to 100, and the pattern of digits, to start calling out, "5 0 0 0 0 0 5 0 0 0 0 0," one digit at a time, just as the computer's answer started to appear on the console. Fortunately it agreed with me. It had of course done the arithmetic the hard way. 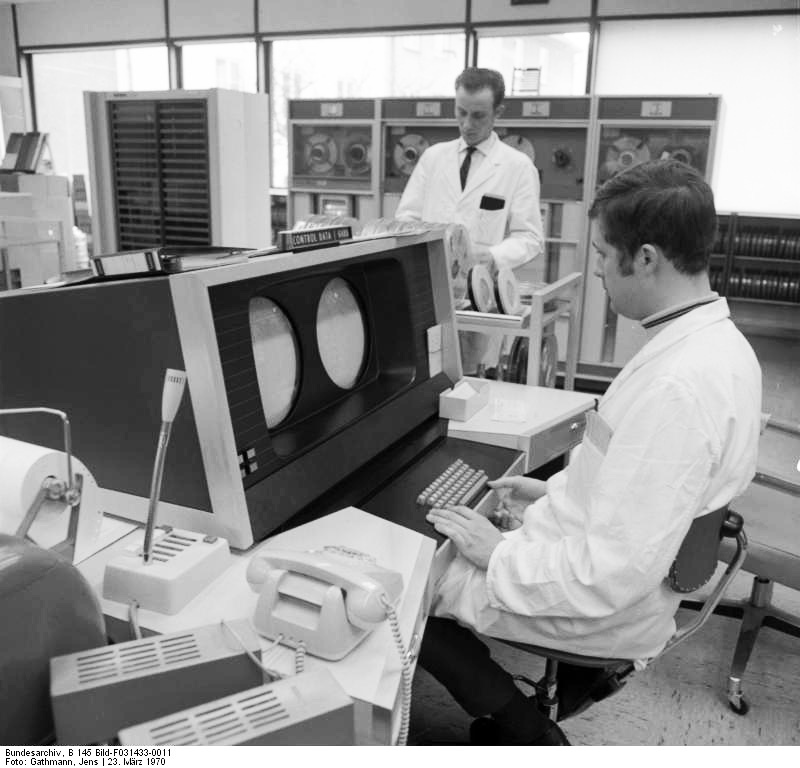 And the CPU clock on a CDC 6400 is only 10 MHz (0.01 GHz), not a lot faster than the first IBM PC, so it took a couple of seconds to launch the program and do a million additions. That was just long enough for me to finish neck-and-neck with it and impress my future wife, the extraordinary Melody Mauldin. 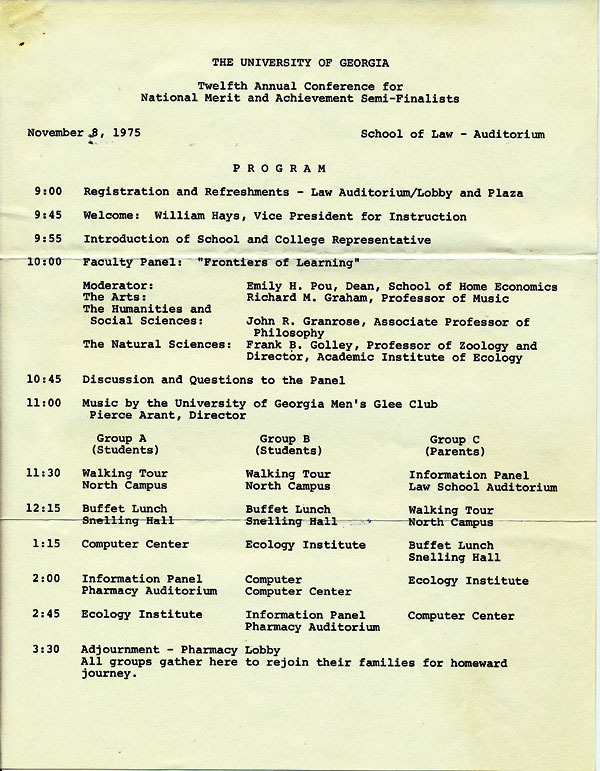 In the interest of accuracy, I must note that the University upgraded from a CDC 6400 to a CDC CYBER 70/74 around that time, and I'm not sure which model they were using on that day. The two look very much alike. The length of time that it took to do the arithmetic makes me think the 6400 is what I matched wits with. 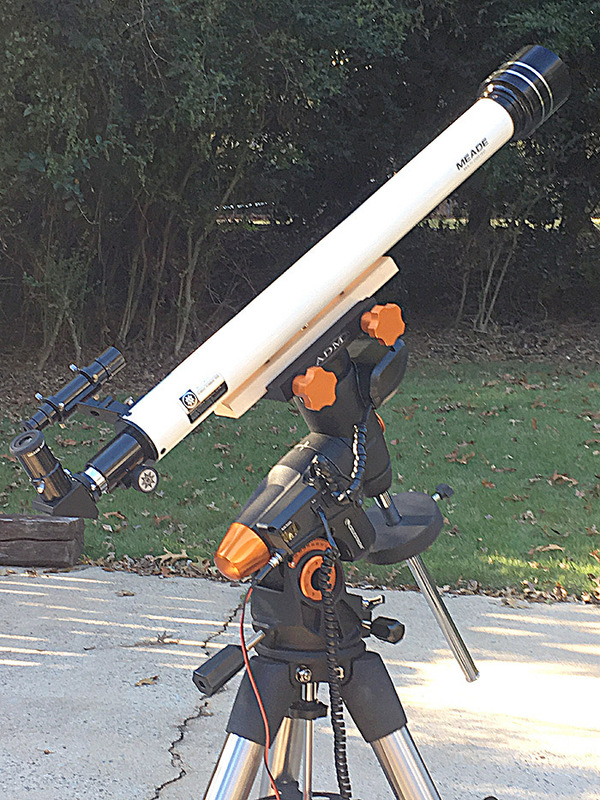 The fixing up consisted of giving it a good cleaning, a new 5×24 finderscope, a 1.25-inch (American-size) focuser, and a new diagonal and eyepiece (actually, at the moment, any of several eyepieces, because my entire collection fits it). The views are quite good. One red herring, during testing, is that a super-economy MA25mm eyepiece that I was using for testing turned out to have spherical aberration of its own. With it out of the way, the telescope itself is either diffraction-limited or close to it. Because the glare stops are for Japanese-size eyepieces, it doesn't work well with some of the widest-field eyepieces, but a vintage 30-mm Criterion "ASP" (asymmetric Plössl?) gives a very sharp view. Not bad at all, if I may say so. One frame, digitally sharpened in the usual manner. Those who read about the astronomy drive-out lights that I added to my car in 2015 may, perhaps, be sad to hear that they were seriously damaged recently, I don't know exactly where or when. Because they still lit up, we didn't notice the damage immediately, but a close look showed that they had been bashed in and their lenses broken. 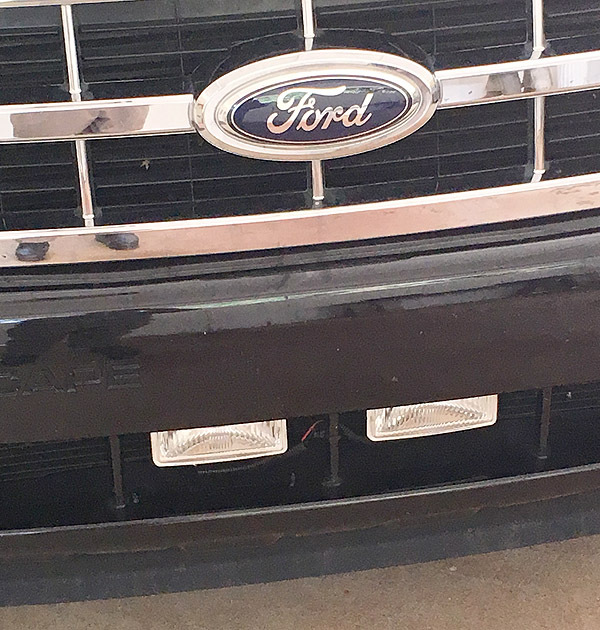 We assume someone backed into them with a trailer hitch, since they're at just that height, and the plastic bumper cover must have flexed as much as three inches, then returned to its original position. 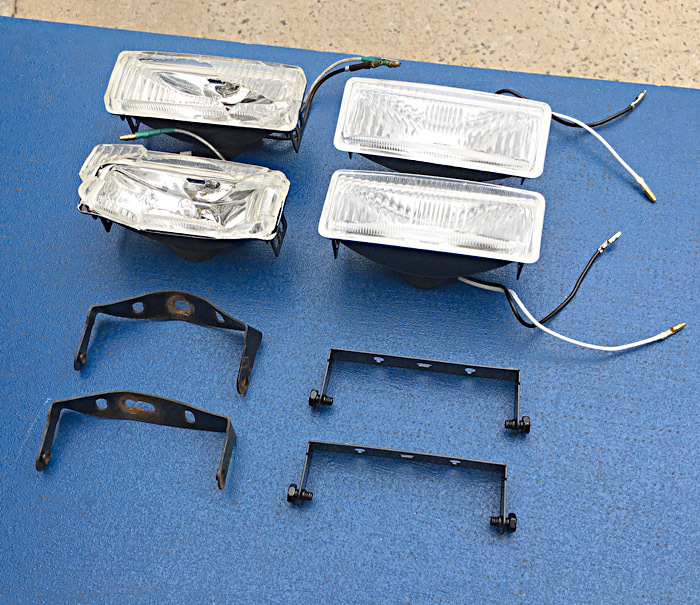 At first we thought a car wash had broken the lenses and displaced the lights, but no — their brackets were severely bent, the effect of hundreds of pounds of force. And those lights and brackets gave their all to protect the air conditioning condenser, which was right behind them! At first I thought about simply removing them, or improvising some kind of new setup with an LED strip, but Melody wisely advised that I wouldn't be happy until I fixed them as good as new. And, fortunately, I had written down in my automotive logbook the make and model of the lights, which are still available on Amazon though not locally. So I ordered them, they came, and in two short sessions I completed the repair. Here you see the old parts and the replacements. Look at how much those brackets were bent! And there they are, good as new. The only excitement during the repair session was when a tube of black silicone seal burst in the middle. I will be getting the black stains off my hands for days. This is a stack of eight 93.5-second exposures taken with a Nikon D5300 at ISO 200 and a Nikon 180/2.8 ED AI lens at f/4, in my driveway in Athens, Georgia. 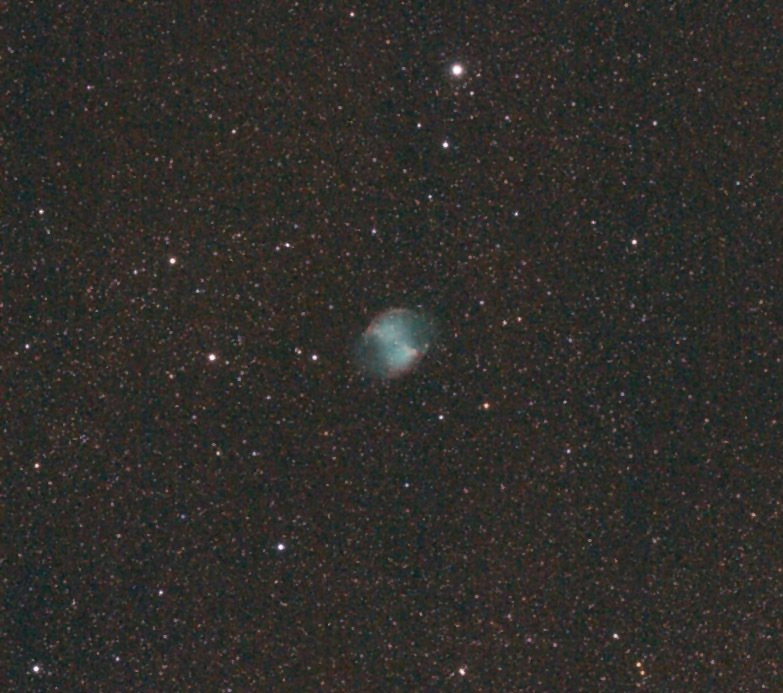 I didn't expect the nebula to show up because the air wasn't particularly clear and this camera does not have extended red sensitivity (to pick up the hydrogen-alpha wavelength at which this nebula shines brightest). But I was pleasantly surprised. On this picture I used some HDR processing to lighten the dark areas and darken the light areas, on a large scale only, so that smaller details would show up. 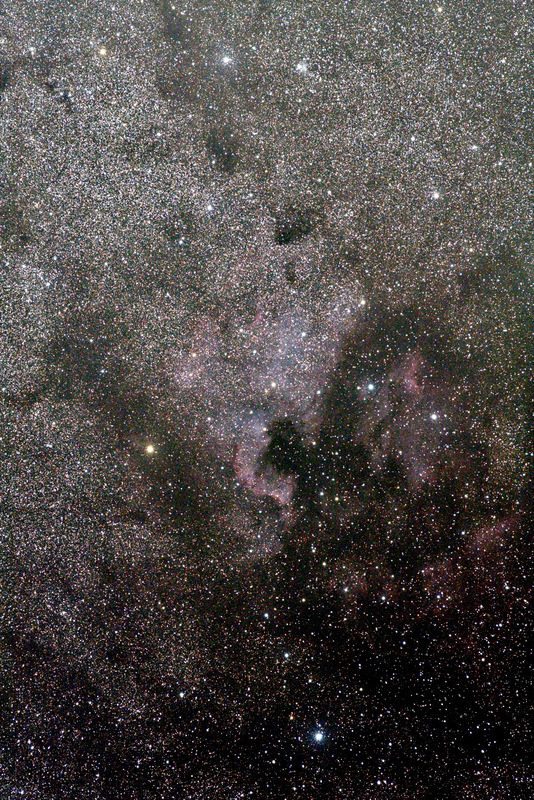 In the original picture, the top, which is a thick star cloud in the Milky Way, was a lot lighter than the bottom. Different camera, different lens, slightly worse atmospheric conditions. This is my Nikon D5300 at ISO 200, a stack of twenty 93.5-second exposures (my timer has ideas of its own about round numbers!) with my vintage Nikon 180-mm f/2.8 ED AI lens at f/4. Again, look how sharp the stars are from corner to corner. The secret to using this lens seem to be to set it to f/4; in those days they didn't aim for optical perfection at the widest aperture, and this one shows an assortment of aberrations at f/2.8. By exposing about 90 seconds instead of 3 minutes, I get perfect tracking without having to make guiding corrections. The 3-minute exposures yesterday were pushing the limits a bit. 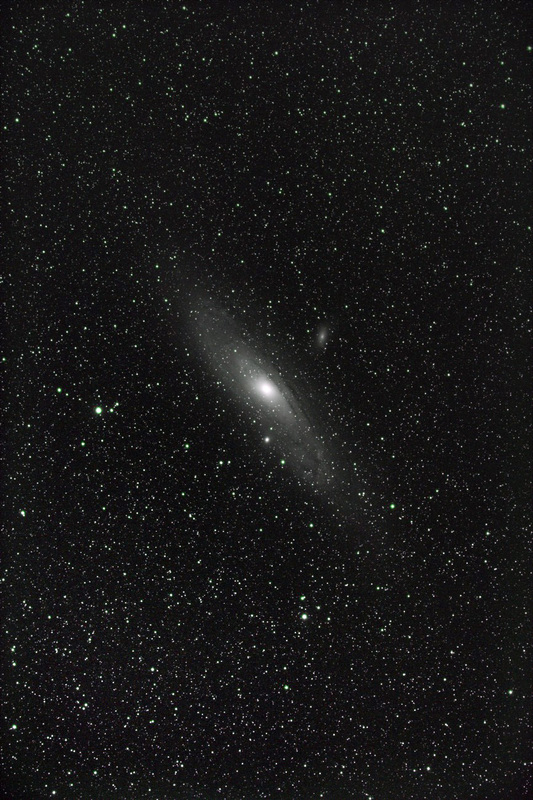 Take a look at this picture of the Andromeda Galaxy. 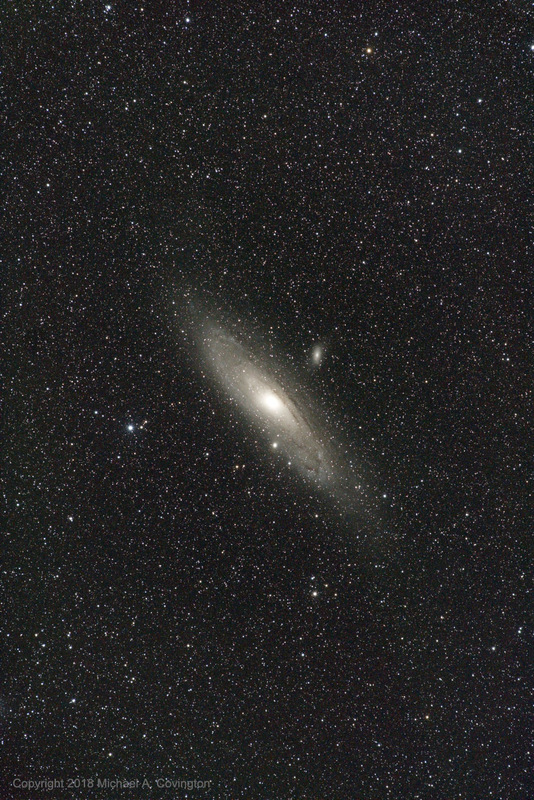 Reprocessed to show more of the galaxy. Click here to see the first version. It's a stack of eleven 3-minute exposures with a Canon 60Da and a little-known vintage lens. Notice that the stars are sharp from corner to corner. Even high-end lenses don't always achieve that. So the lens must be a good one. Right, f/5, not f/4. There is a much more common Zuiko 200-mm f/4 described in the Olympus OM System Lens Handbook, which doesn't mention an f/5 version. And we see from the front that this is an F Zuiko, which means it has six elements. The only information I can find on line about this lens is at Mir in Malaysia, and even he doesn't have an optical diagram of it. Note that the competing 200-mm f/4 lens has 5 elements; the f/5 has six! So the smaller f-stop does not mean this is a lower-quality lens; on the contrary, it is a premium optic. But everyone thinks that f/5 is not as good as f/4, so used lenses of this type are remarkably cheap — often $50 to $100. There are several on eBay right now. Mine is not "MC," not multi-coated, so it must be of fairly early vintage. 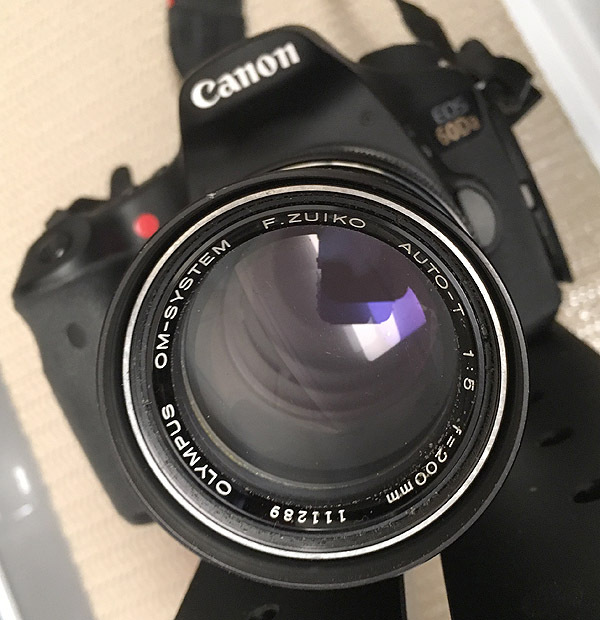 In fact, since it's designed to take the same 49-mm filters as several other Olympus lenses, it probably dates from the very beginning of the OM system, and I would guess that the f/4 lens replaced it later. I know the f/4 lens exists in MC versions. [Update:] What I gather from several sources is that this lens was discontinued early on. 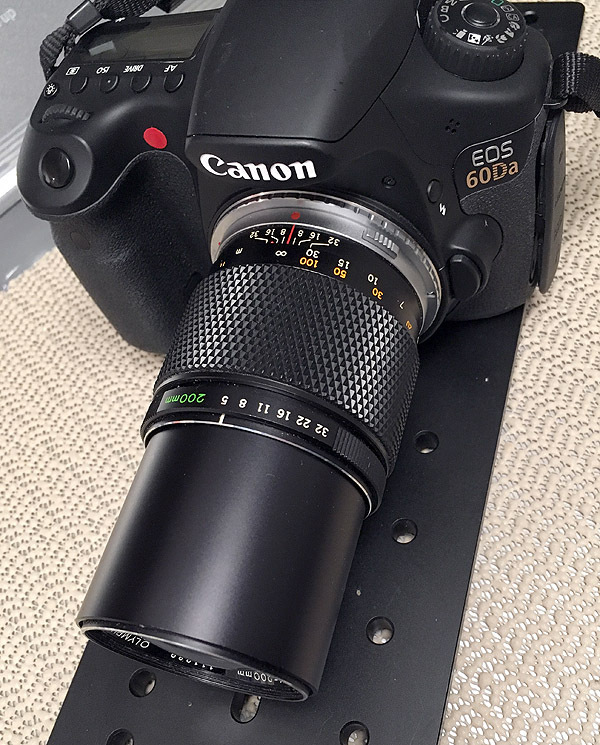 The original idea was that several OM lenses would all take 49-mm filters (50/1.8, 100/2.8, 135/3.5, 200/5). But people felt that 135/3.5 and especially 200/4 were too slow and wanted larger lens openings even if this meant larger filters. Thus the 135/2.8 and 200/4 were introduced. The 200/5 was apparently discontinued before the Lens Handbook came out. What I know is that it's a remarkably lightweight lens, as well as being remarkably sharp. I'll continue to use it. You'll be relieved to know that we got only rain from the hurricane; Athens is in a narrow wedge of Georgia that never had high winds. Just before the hurricane came, our old friend Doug Downing spent several days here, and we did some astrophotography together. Stack of video frames taken in near infrared light with my C8 EdgeHD, 3x extender, and ASI120MM-S camera. 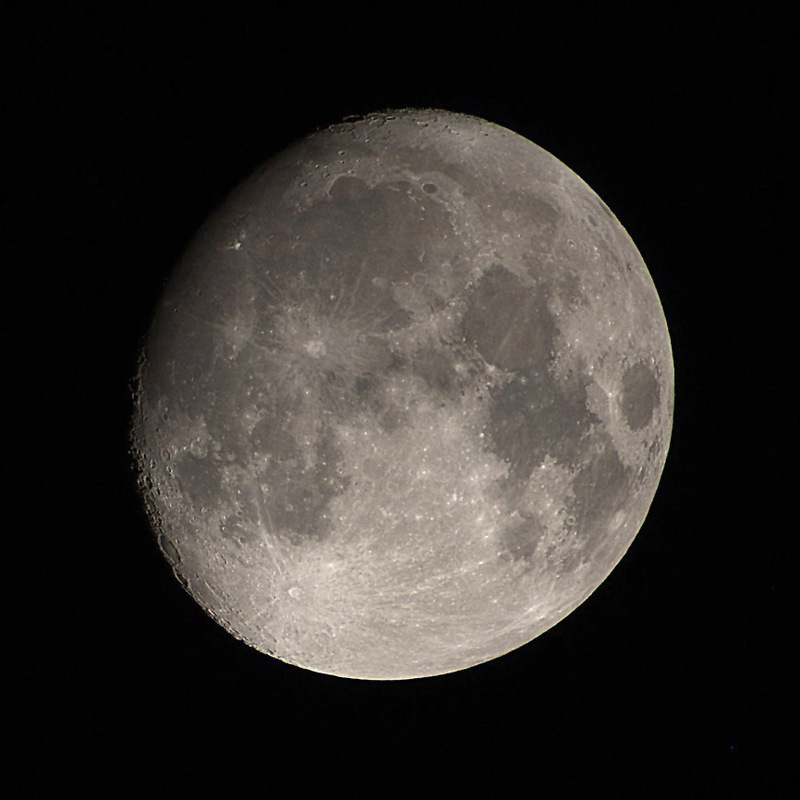 The same picture is shown with different amounts of digital sharpening. The first picture is strongly sharpened and shows lots of detail but also a strong "rind" on the right-hand side; the second picture is less strongly sharpened. 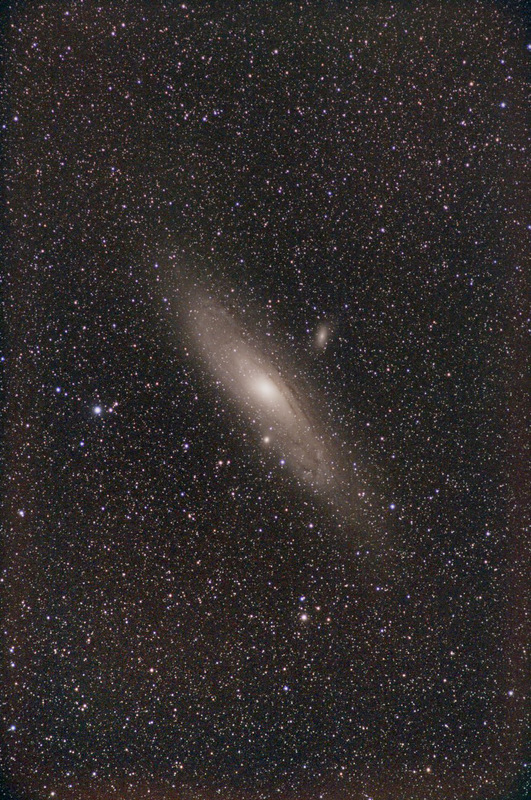 The "rind" is thought to be a diffraction effect in the telescope; it is visible to a slight extent even on images that have not been digitally sharpened at all. 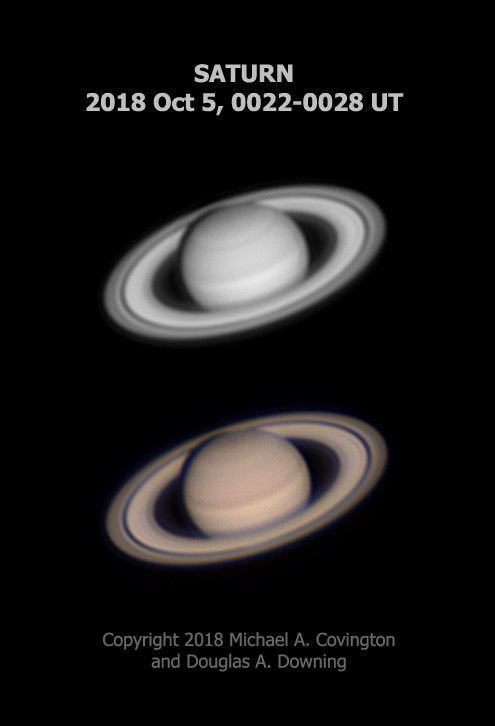 Next, Saturn, in infrared and then in color; same equipment as above, but the color image is with a clear filter and ASI120MC-S camera. I think it's going to be rainy tomorrow. That's Hurricane Michael (not named after me! 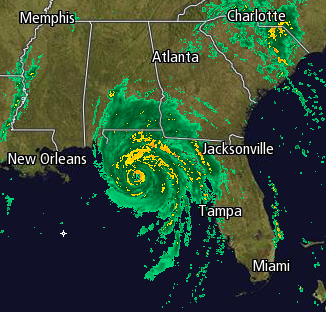 ), coming ashore in Florida and moving northeast. I'm located right at the "a" at the end of the word "Atlanta" on that map. I have learned, without details, that my kindergarten classmate Mende Miller is no longer with us. She was the roller-skating diva of Mrs. Morgan's 1962-63 kindergarten class (Moultrie, Georgia); while the rest of us either struggled through skating lessons or (in my case) sat them out, she made graceful arcs and circles all over the skating rink (and I watched). I haven't seen Mende since kindergarten or shortly afterward but had heard from her in recent years on Facebook. I know little about her adult life. My understanding is that she graduated from Moultrie High School in 1975 and that at the time of her death, she had recently moved to Kansas City, Missouri. You haven't been hacked or impersonated. Somebody just sent you a copy of a message that is being copied and forwarded like wildfire. Contact the person who sent you the message and ask, "Did you really get a suspicious friend request from me? And did you type that message yourself? And if you didn't get a friend request from me, why did you tell me you did?" 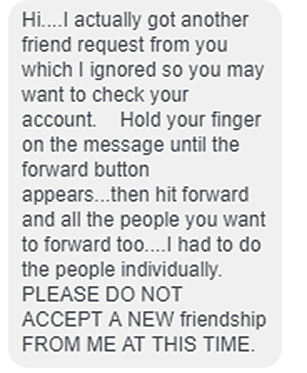 Normally the answer is no — they didn't get a friend request — they just forwarded the message because it said to forward it, even though it is not true. That's why it is letter-for-letter identical, including a spelling error, everywhere it turns up! Some people can't resist following instructions from a total stranger. The people who forwarded this should be embarrassed. They have made pests of themselves. I have friends who have gotten 20 or 30 copies of the message. Click here for more details (from Lifehacker). Contrary to my earlier suspicions, there is no sign of any malware, virus, or hacking being involved. It is just people telling each other to forward a message. Now if someone did get a friend request apparently from you, even though they're already on your friends list, click here to learn how to detect impersonation and what to do about it. And check your Facebook security settings. If you think someone might have gotten into your account, change your password and set Facebook to e-mail you whenever people log into your account. "Ahoy-hoy!" 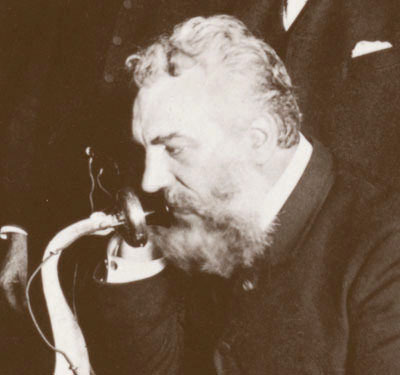 is how Alexander Graham Bell wanted people to answer the telephone. (Only Mr. Burns, on The Simpsons, actually does.) Edison advocated "Hello," which caught on. Both wanted to stem what they considered the rude practice of answering the phone with "Who is this?" or calling someone and responding to their answer with "Who is this?" Better yet, said the experts, was to answer the telephone by identifying yourself — which is what I do. "This is Michael Covington, may I help you?" Robocalling machines think I'm speaking gibberish and don't play their recordings. As you read this, my home telephone number (ending in 3), the number I've had since 1973, has been ported over to a Spectrum VOIP line, and POTS (land line service) to my house has been discontinued. The VOIP modem fakes a POTS exchange so well that all we had to do was connect it to the house telephone wiring, and we get a dial tone and can dial in the usual manner (with tone dialing; I don't know if pulse dialing is supported). The sound quality is, if anything, better than before. And I can guess that AT&T was already doing much the same thing. I suspect the wires to my house didn't go all the way to a bank of 48-volt batteries and other hardware downtown, but rather to a VOIP modem just down the street or up on a pole somewhere. What was disappointing is that the porting took 4 days. It was scheduled for October 2, so on the evening of the 1st, I went under the house and changed the wiring. On October 3 the porting didn't happen; the old number still went to the AT&T wires, now disconnected, and anyone who dialed it would hear a ringing signal that was never answered. Meanwhile, the VOIP line worked, but with a temporary number. On October 3 the AT&T line went dead; anyone dialing our old number got warning tones and "This number is not in service." So it remained until I called Spectrum today (October 5), and they performed the changeover as I talked to them. Naturally, I was talking to them on the VOIP line and got cut off, but then they called me at the new number. There is a good side to this. For more than two days, all those robocallers were getting "This number is no longer in service," with warning tones that their equipment could easily recognize, and today they haven't been calling us! For her birthday Melody was taken to dinner by two Yale Ph.D.'s. That's what it takes to keep up with her formidable intellect.